Seventy four members shared a good time at Alexander's Steak House for the 2017 Christmas Party. All the ladies were on Santa's Nice List and received a fresh flower. Unfortunately the men were on the Naughty List and received nothing.. The club wishes to express our condolences to Becky (Bob Patten's girlfriend) in the loss of her son, David Hughes, on December 8, 2017. Arrangements are being handled by Preston-Hanley Funeral Homes & Crematory in Creve Coeur. The December meeting was called to order at 6:30 PM by club President David Bowles. He welcomed 41 members. David wished a happy birthday and happy anniversary to members celebrating in December, and also Merry Christmas and Happy New Year! The greeter was Harry Sweet. Secretary’s Report - A motion was made by Dennis Dunn to approve the minutes as presented and were seconded by Jim Lowry. The minutes were approved. Treasurer’s Report - MICC Treasurer Mourina Sweet gave the report, including a detailed breakdown of all transactions. There were no questions or corrections, and a motion was made by Buddy Turner and seconded by Mike Branham. The treasurer’s report was approved. Governor’s Report (Sandy Arnold) – NCCC membership packets will no longer be sent in the mail. You will receive your renewal notice in an email. You will need to print your NCCC card. If you have difficulties doing so, please forward the original email to Sandy and she will print your card. Sandy has 20 raffle tickets for sale to benefit the NCCC St. Jude Charity. The Winner will be drawn on July 20th, 2018 at the convention in New Orleans, LA. Only 2,000 - $50 tickets will be sold. The winner will receive a certificate valued at $55,000 towards a new Corvette OR $40,000 Cash option. This will be the last year for the Corvette raffle. Activities (Jim Gehrig) – The Christmas party at Alexander’s was hugely attended by so many and it was a very festive time. Thanks Branhams for planning it! Merry Christmas and HNY All! Membership (Tracy Adamson) – The updated membership directory will be sent by the end of the month. Be sure to let Tracy know if you need to make any changes to your contact information. Newsletter – Submit your information for the newsletter to Moe by the 25th of the month. Old Business – At the time of the meeting, there were 3 Dining Books left. These make great Christmas presents. Please contact Sue McMorris if you would like to purchase them for $25 each. Shoes for Students (Moe Sweet) – In 2017, the Mid-Illinois Corvette Club collected donations of $1295 dollars to be spent on shoes for students of Pleasant Hill Elementary School. Thank you for those who signed up to help the kids pick out shoes. Shopping date is December 15. Trivia and 50/50 – Trivia: What year did Corvette introduce the Sting Ray duck tail rear end? 1961 was the correct answer which wasn’t answered correctly. Next month it will be $30 to the winner. 50/50: $40 to the winner tonight, who was Marilyn Carls. She donated her winnings to the St. Jude Drive. A motion to adjourn was received by Jim Lowry and seconded by Dee Taylor. The meeting was adjourned at 6:50 PM. The November meeting was called to order at 6:33 PM by club President David Bowles. He welcomed a big crowd of 64 members and 4 guests. The guests tonight were Ron & Peggy Taylor, who own a 2008 Atomic Orange Z06, and Chuck & Connie Bradle, who own a 2008 White Coupe. Welcome all! David wished a Happy Birthday and Happy Anniversary to members celebrating in November. Greeters tonight were Harry Sweet and Dan Hittinger. Secretary’s Report - A motion was made by Don Karnes to approve the minutes as presented and seconded by John Haas. The minutes were approved. Treasurer’s Report - MICC Treasurer Mourina Sweet gave the report, including a detailed breakdown of all transactions. There were no questions or corrections, and a motion was made by Buddy Turner and seconded by Jim Lowry. The treasurer’s report was approved. Governor’s Report – no report. Activities (Jim Gehrig) – Everyone is invited to come out to Fairview Farms on Friday, November 17 at 6:00 PM to meet the new Activities’ Director Rich Anderson. There is a survey of 2018 activities that Rich would like your input. Pick one up at the December meeting or contact him directly. The Christmas party will be held at Alexander’s Steakhouse on Saturday, December 9, 2017 at 5:00 PM. Please contact Jim Gehrig and/or accept the Google calendar invitation to RSVP. 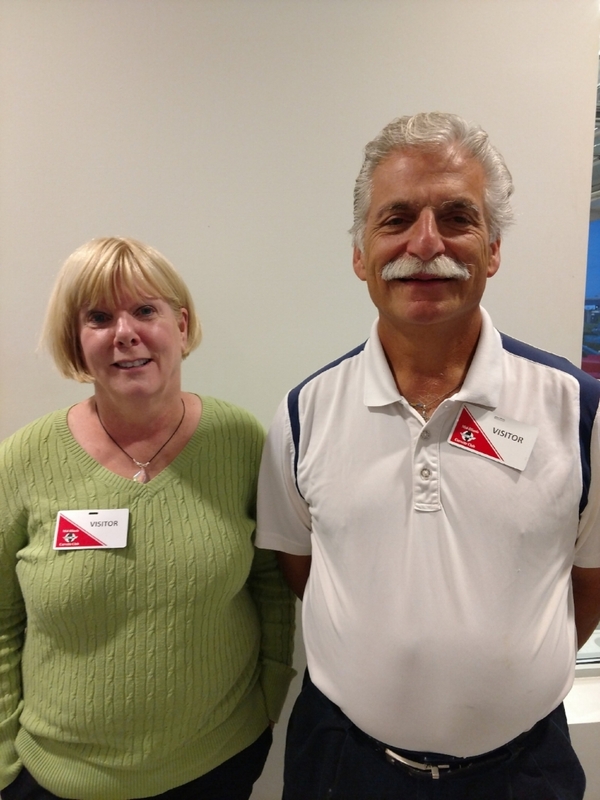 Membership (Tracy Adamson) – Chuck & Connie Bradle joined the club tonight. Membership renewals are being finalized by the end of the week. Touch base with Tracy to renew your membership. Newsletter – Submit your information for the newsletter by the 25th of the month to Moe. There are three Dining Books left. A vote was taken at the meeting for a decision on whether or not more books should be purchased. No more will be ordered at this time. Salvation Army Ringing of the Bells (Larry & Diana Mooney) – Thank you to the many members who rang the bells on November 11 at the Hy-Vee on Sheridan. We will return to Hy-Vee on November 18, so come out and show your support. If you’re interested in ringing the bells, contact Larry or Diana. St. Jude Drive Gift Wrapping at Bass Pro Shop (Jessica Lowry, Connie Durham) – On December 2, we will be wrapping gifts to benefit the St. Jude Drive. The shifts are 10:00 AM to 1:00 PM, and 1:00 to 4:00 PM. Wear your St. Jude Drive shirts. Four wrappers are needed per shift. Shoes for Students (Moe Sweet) – On December 15, we will be helping students of Pleasant Hill Elementary School buy shoes with our donations collected this year. Two people are needed to meet at the school (3717 W. Malone, Peoria) at 8:45 AM and travel with the bus, and four additional people are needed to meet at 9:00 AM at the Payless Shoes on University Street. Our goal this year is $1,000, and a box was passed around at the meeting to collect any last minute donations. Trivia: What year did GM start using the GM “Mark of Excellence” on the Corvette? 2006 was the correct answer which wasn’t answered correctly. Next month it will be $20 to the winner. 50/50: $50 to the winner tonight, who was Dan Hittinger. He donated the proceeds to the Shoe Fund. Members had a fun day eating at Destihl Restaurant and attending the car show. Three new members in October. Welcome to the club. The October meeting was called to order at 6:32 PM by club President David Bowles. He welcomed a big crowd of 57 members and 3 guests. The guests tonight were Jerry Lancaster who owns a green 1994 C4, and Mike & Ann Domico who own a 2002 Coupe. Welcome all and hope you come back. David wished a Happy Birthday and Happy Anniversary to all members celebrating these in October. Greeter at tonight's meeting was Harry Sweet. Secretary’s Report - A motion was made by Jim Lowry to approve the minutes as presented and seconded by Will Kessinger. The minutes were approved. Treasurer’s Report - MICC Treasurer Mourina Sweet gave the report, including a detailed breakdown of all transactions. A copy was passed around for all to review. There were no questions or corrections, and a motion was made by Buddy Turner and seconded by Jim Lowry. The treasurer’s report was approved. Activities - Jim Gehrig- if you want to sign up for outings and events, please contact Jim Gehrig at 309-246-4691. In Jim’s absence, Dave Bowles went over the activities list. The Hound and Hare Rally will likely be canceled due to lack of interest. Moe will notify those who have signed up. The Christmas party will be held at Alexander’s Steakhouse on Saturday, December 9, 2017 at 5:00 PM. Please sign up at the November meeting, accept the Google calendar invitation or contact Jim Gehrig. Membership - Tracy Adamson – If you have any changes to your contact information, let Tracy know to update the membership directory. We had three people join tonight. They are Jerry Lancaster and Mike & Ann Domico. Welcome, now let’s have some fun! Newsletter - Mourina reminded everyone the submission deadline for any newsletter information is the 25th of the month. Governor’s Report - Governor Sandy Arnold – no report. Old Business - Ballots must be postmarked by October 15th in order for them to be counted. Ballots will be counted before the November meeting and new officers will be announced during the meeting. There are three Dining Tour coupon books remaining. Sue McMorris suggested the club order 20 more books, as there has been increased interest. Roger and Mary Stone have past club shirts available for anyone who would like to take them. Trivia and 50/50 - In 1964 the Borg-Warner 4-speeds gave way to these ‘rock crusher’ tyrannies for the Vette. A) Muncie, B) Powerglide, C) Super T-10, D) Top Flight. The correct answer was - A) Muncie and was worth $10. Mary Stone answered correctly. She donated her winnings to the Shoe Fund. The 50/50 drawing was $55.00 tonight to the winner who was Jodie Lawrence, and donated her winnings to the Shoe Fund. Adjournment - A motion was made and seconded to adjourn the meeting at 7:04 PM. · Introduction of Guests and Visitors – Michael & Susan Andresen from Westminster Village, Rod Wand (2017 Z06), and 2nd time visitor Ron Zimmerman. 76 members were in attendance. · President – Dave Bowles – Dave acknowledged those who celebrate birthdays and wedding anniversaries in September. · Vice President – Rick Doro. No report. · Treasurer – Moe Sweet – A copy of the treasurer’s report with copies of checks written and deposits made circulated during the meeting for reference. This is a new way to present the report and we hope everyone likes it. Darlene Corrie made a motion to approve and George Taylor seconded. The treasurer’s report was approved. · Secretary – Sherie Hittinger – A motion received to approve the August 14, 2017 minutes by Roger Stone and seconded by Dee Taylor. The minutes were approved. There was a correction to the July minutes due to a miscommunication of the overall total donation to St. Jude’s. The correct amount is $7,361.40. A motion to accept the correction was received by Bruce Adamson and Mike Durham seconded. The correction was approved. · Governor – Sandy Arnold – The Roger Clancy Humanitarian Award is given annually to a NCCC member who has gone the extra mile. Two of the three nominees for 2017 are from our club! Congratulations to Gary Uftring and Connie Durham. Deb Lindsey, Director of Sponsorship, Cowtown Vettes, Southwest Region, received the award. Please view Sandy’s full Governor’s report as posted to the MICC website on September 13, 2017. · Membership – Tracy Adamson –Reminded us that our dues are DUE now and need to be paid by October 15 or a late fee will be applied by NCCC. Call Tracy to confirm membership amount at 309-263-7340. · Activities – Jim Gehrig –Lots of activities in the next month coming up. 9/14 Harley Ride Send-off from Walters Brothers on Maxwell Rd. Be there early for parking; presentation at 6:30 am. Harry Sweet is the contact. 9/22 Elmwood High School has invited our club to their parade to drive their homecoming court in our convertibles. All Corvettes are invited. Call Jim Gehrig with your interest. 9/30 Westminister Village Car Show, guest speaker Susan Andresen, Director of Life Enrichment at WV, personally invited us to join their 350 residents for a mixed car show. All cars are welcome. Please come and fall in love with the residents and spend your day with them. Coordinators are Robin Jones & Jim Dunlap. 10/14 Drive & Dine to the Chanticleer in Eureka. Leave from Uftring at 4:15 pm and cruise to restaurant. 10/21 Hound & Hare Rally with details to come at the October 9th meeting. 12/9 Annual Christmas Party. Mark your calendars. Two venues were presented: Opt 1 -A private room at Alexander’s Steakhouse in Peoria (no room cost and everyone will be on their own with no money collected in advance); Opt 2 -Timberlake Country Club off Farmington Rd., Rich Anderson is a member of their club (2-meat buffet, $20 per person + gratuity. Pay TCC directly). There was a vote taken and the Christmas Party will be held at Alexander’s. There is $400 budgeted for this event. Jim Ortiz would be interested in being our DJ for the evening. · Newsletter – Moe Sweet –need items for newsletter by 9/25. · Nominating Committee - Peggy Karnes announced the following nominations. Connie thanked everyone she spoke with and for all who stepped up to serve on the 2017 MICC Board. Ballots need to be postmarked by October 15. · At Vettes on the River (LeClaire, IA), MICC tied for the club with the largest number of Corvettes participating, and we received a really nice trophy. Steve Barton won a 1st place trophy for his C6, and Jim Lowry won the 50/50 drawing. It was a great day for all who attended. · Dining books – Sue McMorris –The profit ($10) from each book sold helps to subsidize our sponsorship of the St. Jude Drive, which is $1,000. The books are $30 each. There are 17 left and she can get more. We have collected $750 up to tonight’s meeting. · St. Jude Drive –John Haase – The Yeagers from Mid-America Corvette Designs in Effingham are leading a group for next year’s drive. Mid-America has developed a ‘round up’ program at point of sale to raise funds for St. Jude. Gary Uftring expressed his show of support and sponsorship by the Uftring Dealerships and the Mid-Illinois Corvette Club of the St. Jude Drive. Dave Bowles shared his personal affiliation with St. Jude. · 9/23 St. Jude Walk/Run at Northwoods Community Church. Cost: $10 to walk 1 mile. Lots of activities beginning at 8:30 am for runners and 8:35 am for walkers. Drive your Corvettes. Sign up online. Brochures available on the table tonight or contact Connie Durham. · Rik Doro –thanked everyone for their thoughts and prayers for his daughter Melissa. · 50/50 winner –Winner of $74 is Mike Branham, and he donated his winnings to the Shoe Fund. · Corvette Trivia –Winner is Roger Kasky. MICC tied for the club with largest number of Corvettes participating at Vettes on the River. Steve Barton won with his C6 Corvette and Jim Lowry won the 50/50 drawing. It was a great day for all that attended.